Welcome to our Air Duct Cleaning Web Site. 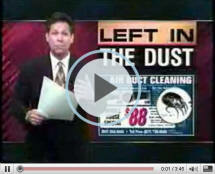 Welcome to Dapper Ducts, Inc. the area leader for indoor air quality. We offer air duct cleaning, dryer vent cleaning, and chimney cleaning services to Washington DC, Northern Virginia and Maryland. Dapper Ducts, Inc. is a family run company. We have many years of experience performing air duct cleaning, chimney cleaning/chimney sweep services and dryer vent cleaning services in DC, MD and VA.
Our goal is to educate the consumer about the importance of indoor air quality, and the benefits of maintaining clean air ducts, dryer vent ducts and chimneys. Please visit the services section of our website to read about the procedures we use when cleaning your air ducts, chimney and/or dryer vent. Below you will find our online estimate request form. Please fill out this form and one of our customer representatives will contact you promptly. We do not share your information with a third party. 1. How many furnaces/air handling units are in your home? 2. Where is your furnace located: the attic basement closet or other? 3. How many vents do you have in your home (supply and return vents)? Combination of the above (please list). Dapper Ducts, Inc. offers expert residential and commercial air duct cleaning, dryer vent duct cleaning and chimney sweep services to the Washington DC, Northern Virginia and Maryland metropolitan areas. A study conducted by the United States Environmental Protection Agency found that indoor air is 70% more polluted than outdoor air. Air duct cleaning services reduce allergens and bacteria in the air resulting in improved air quality, increased air flow, and ensure your heating and cooling system runs more efficiently, thereby lowering your monthly energy bills. A clean air duct system will help ensure that the air you and your family breathes is cleaner and fresher. Dryer vent duct cleaning reduces the chance of a fire in one's home and is important for both safety and economic reasons. A clogged dryer vent can be a hazard. Dryer vent ducts should be cleaned bi-annually or annually depending on the amount you use your dryer. Chimney cleaning/sweep can also improve air flow and reduce the chance of a fire in one's home. Dapper Dapper Ducts, Inc. sweeps your chimney to aid in the prevention of fires caused by creosote buildup in the flue, birds nests, or cracks in the chimney. It is especially important to maintain the chimneys in older homes. The chimneys in these homes may not have been used in several years. Dapper Ducts, Inc. provides expert chimney cleaning /chimney sweep and dryer vent exhaust cleaning services and makes you and your family feel safer about living in your home. We pride ourselves on being a registered member of NADCA, the National Air Duct Cleaner's Association, the National Chimney Sweep Guild and the Better Business Bureau. The National Air Duct Cleaner's Associations regulates air duct cleaning procedures, to which member firms must adhere. 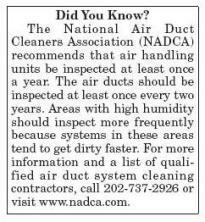 Our membership in NADCA puts us a cut above the rest in the air duct cleaning field. Dapper Ducts cleaning offers only quality services using technologically advanced equipment. We invest in the education of our technicians, as they take classes and training seminars and we adhere to the highest standards established for the air duct cleaning industry. Dapper Ducts, Inc. offers commercial and residential clients air duct cleaning, dryer vent cleaning and chimney cleaning/ chimney sweep services in Washington DC, Northern Virginia and Maryland at affordable rates; each job is performed by a certified technician who is educated and knowledgeable in the air duct cleaning industry. No job is too small. We serve all clients with the same dedication and goal in mind: improving your indoor air quality. Please visit our references page to view the praise we have received from both of our residential and commercial clientele. We are recognized by our clients as dependable, educated and honest air quality service providers. Learn More about the importance of choosing a certified air duct cleaner.